Kathmandu, Feb 4: Kathmandu Model College, Balkumari organized the 11th Convocation Ceremony on Monday, February 4 at Soaltee Crown Plaza. 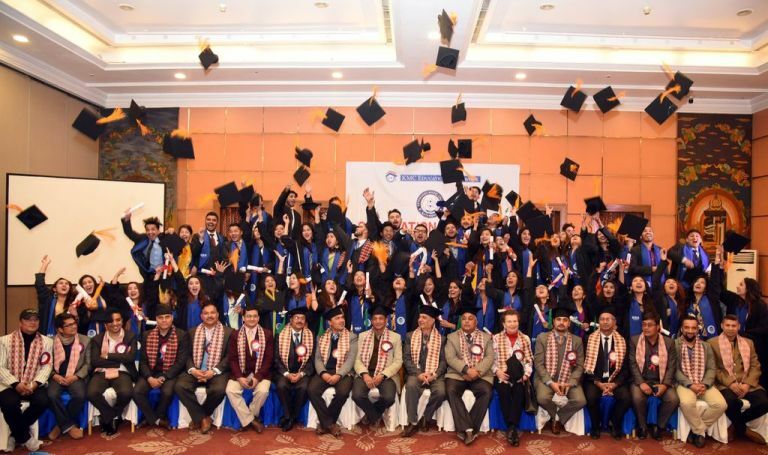 63 students who were enrolled in the BBA program during the academic year 2071 B.S graduated this year. The ceremony was chaired by the principal of KMC, Mr.Surendra Subedi. College Director of KMC, Mr. Kishore Gautam welcomed the guest and said that students should implement the academic knowledge in their practical life too. Chief Guest of the program Prof. Dr. Kundan Dutta Koirala shared his own experience with the recently graduated students. He said that he aimed to be a good teacher while was a student and he is still enjoying his profession. He also advised students to choose a career that suits their passion and they should plan about their future accordingly. Key Note Speaker of the Convocation, Mr. Sixit Bhatta, CEO of Tootle while addressing the graduates said that the market is dynamic as the technology is developing rapidly and every student should plan their career with taking consideration for the future job market. The event was graced by Nathalie Friedan who is a professor at Fribourg University Switzerland. In her address, she said that she is happy to see the increase in the number of female graduates here in Nepal. She also added that she is observing the Nepalese Society since the past 45 years and as Nepal is developing rapidly the educated youth should show proper direction. Mr. Biswas Pandit bagged KMC Excellence Award with a purse of Rs. 15,000/-. This award is given annually to excellent students. Mr. Pandit said in his address that enrolling BBA program at KMC is the most important decision of his life. He also highlighted the role of KMC for the overall development of students. The principal of KMC Mr. Surendra Subedi said that KMC has grown to an excellent academic institution and the College is playing an important role to shape the career of the students while they were students at the College and in the job market as well. The convocation ended in joy as the students of 7th Semester showed cultural programs followed by Socialization and Group photographs. Kathmandu Model College (KMC) was established in 2000 and is located in Balkumari Lalitpur. Kathmandu Model College continues to be a top ranking college in the private sector with excellent scores in BBA, BBS, and BA/BSW programs. In Master's level,KMC is running MBS and MA English program with affiliation from Tribhuvan University.